Dovetail drawers are found in high quality furniture pieces like chests, bureaus, and other items that have drawers or exposed compartments. The dovetail joints have been created by fine craftsmen for many years to make the drawers stronger and long lasting. No one knows exactly when carpenters began to use the dovetail joint to create pieces of furniture, however, archeologists have found furniture in ancient Egyptian tombs with drawers that were crafted using this method and still intact! For a long period of time, the dovetails would be covered by a wood veneer when the carpenter completed the object. Today people recognize the dovetail as being a high-quality joining technique, and they are left uncovered. This enables buyers to examine the joining in order to judge whether the furniture is likely to last many generations. To create a dovetail joint, the wood at the end of the board is cut to complement the board that it will be connected to. The pieces fit together making a solid joint that resembles a dove's tail with its triangular shape alternating between the two boards. The triangular section is known as the "tail", and the space between the sections is known as the "pin". The "tails" and "pins" that can be cut by high-powered equipment are cut just as precisely as the hand cut versions that came before them. The "tail" must fit perfectly into the "pin" or the piece will not be as strong as it can be. Picture how your hands interlock when you slide the fingers of one hand between the fingers of the other hand. After the pieces are put together, the craftsman uses glue to hold the sections in place. Together, the use of glue and interlocking pieces creates one of the strongest joints that can be crafted from wood. 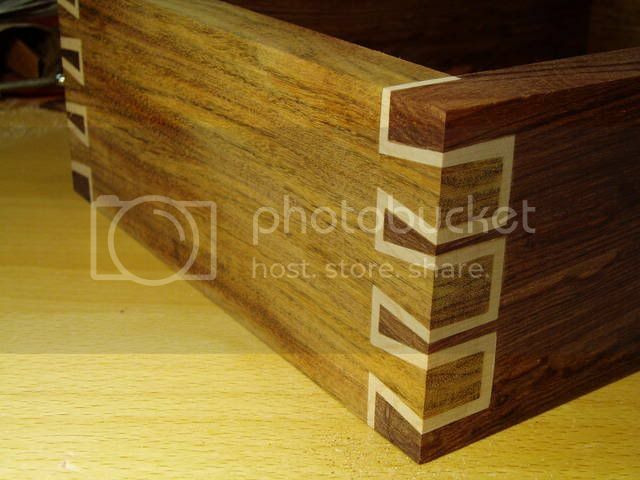 A specialized dovetail joint called the "secret mitred" dovetail can be found in some of the highest quality cabinets and furniture pieces. This technique is also called a "full-blind" dovetail. This type of dovetail has the strength of the common dovetail joint with the advantage of the joint being completely hidden from view once the piece is finished. This type of joining is often referred to as a "French Dovetail" when it is used to create drawers. This joining type creates a drawer of incredible strength and exceptional beauty. In the beginning, a carpenter would painstakingly cut the triangular dovetails and matching spaces into the edge of the wood using wood chisels and precision saws. The process of making the joints was time consuming, but once created, the joints held the piece of furniture firmly together so well that the pieces often lasted through many generations before weakening. This handcarved process continued up until the 1890s when American furniture was in high demand, and the craftsmen could not keep up with the orders they were receiving. A steam powered carving machine and a steam powered router were invented revolutionizing the furniture industry. Though hand-cut pieces are primarily a thing of the past, the mechanization of dovetailing has done nothing to diminish the strength and beauty of the dovetail. When you buy a piece of furniture that has drawers check to see if it has dovetail joints holding the sides of the drawers in place. These joints will mean the difference between a product that lasts a few years and a product that lasts many lifetimes. Check out some of our dovetailed furniture on Interior Clue! Photo cred to Lumber Jocks. Thanks for keeping hand-cut dovetail joints alive.